جوان نژاد, رضا, قادر, سرمد. (1396). کاربست روش مک‌کورمک فشرده مرتبه چهارم با پیمایش زمانی رونگه‌-کوتا چهار مرحله‌ای برای مسئله تنظیم راسبی غیرخطی ناپایا. مجله ژئوفیزیک ایران, 11(3), 57-74. رضا جوان نژاد; سرمد قادر. "کاربست روش مک‌کورمک فشرده مرتبه چهارم با پیمایش زمانی رونگه‌-کوتا چهار مرحله‌ای برای مسئله تنظیم راسبی غیرخطی ناپایا". 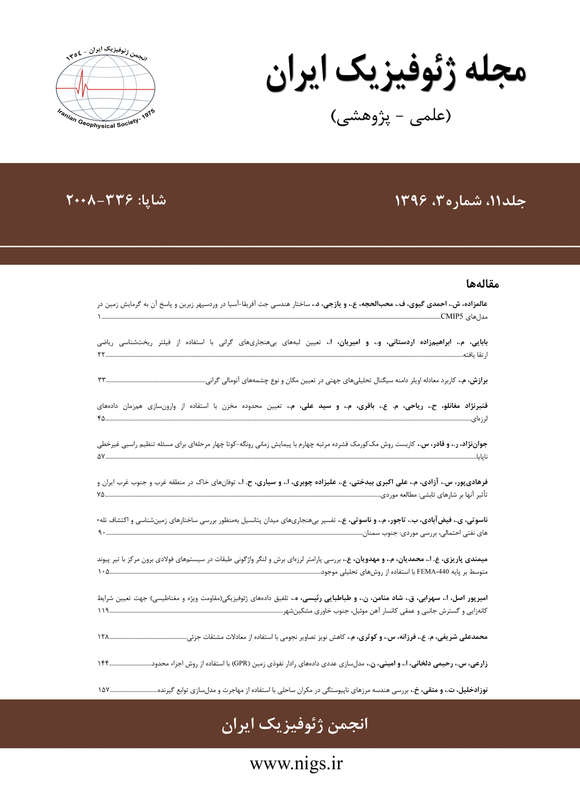 مجله ژئوفیزیک ایران, 11, 3, 1396, 57-74. جوان نژاد, رضا, قادر, سرمد. (1396). 'کاربست روش مک‌کورمک فشرده مرتبه چهارم با پیمایش زمانی رونگه‌-کوتا چهار مرحله‌ای برای مسئله تنظیم راسبی غیرخطی ناپایا', مجله ژئوفیزیک ایران, 11(3), pp. 57-74. جوان نژاد, رضا, قادر, سرمد. کاربست روش مک‌کورمک فشرده مرتبه چهارم با پیمایش زمانی رونگه‌-کوتا چهار مرحله‌ای برای مسئله تنظیم راسبی غیرخطی ناپایا. مجله ژئوفیزیک ایران, 1396; 11(3): 57-74. در پژوهش حاضر، به بررسی خطای بریدگی و آهنگ همگرایی روش مک­کورمک فشرده مرتبه چهارم با پیمایش زمانی رونگه-کوتا چهار مرحله­ای پرداخته می­شود. برای انجام این تحلیل از معادله فرارفت خطی یک‌بعدی استفاده شده است که دارای حل تحلیلی است. خطای بریدگی برای روش‌های مک­کورمک مرتبه دوم، مک­کورمک فشرده مرتبه چهارم با پیمایش زمانی مرتبه دوم و مک­کورمک فشرده مرتبه چهارم با پیمایش زمانی رونگه-کوتا چهار مرحله­ای استخراج و بیان شده است. برای به‌دست آوردن خطای بریدگی از معادله فرارفت خطی یک­بعدی با ضریب ثابت استفاده شده ‌است. همچنین برای بررسی دقت آهنگ همگرایی برای روش­های متفاوتی از جمله لکس­وندرف، لیپ­فراگ، بیم­وارمینگ و همچنین روش‌های مک­کورمک کلاسیک با گسسته­سازی‌های مکانی مرتبه­دوم و فشرده مرتبه­چهارم و گسسته­سازی زمانی رونگه-کوتا چهار مرحله­ای به­دست آمده است. نتایج نشان می­دهد آهنگ همگرایی به‌دست‌آمده برای مسئله خطی متناسب با آهنگ همگرایی نظری می­باشد. در ادامه نتایج حل عددی برای مسئله تنظیم راسبی غیرخطی ناپایا و برای حالت‌های یک‌بعدی و دو بعدی با استفاده از روش مک­کورمک فشرده مرتبه چهارم با پیمایش زمانی رونگه-کوتا چهار مرحله­ای مورد بررسی قرار گرفته است. مقایسه نتایج به‌دست‌آمده از روش مذکور برای دو مسئله یک و دو بعدی با نتایج حاصل از کارهای سایر محققان گویای عملکرد مناسب این روش است به‌ویژه هنگامی‌که میدان حل با ناپیوستگی همراه باشد. By increasing the computing power of computers, the advantage of high-resolution numerical methods for numerical simulation of the governing equations of fluid flow is further emphasized. Recently, increasing the accuracy of numerical methods used for simulation of fluid dynamics problems, particularly the geophysical fluid dynamics problems (e.g., shallow water equations) has been the subject of many research works. The compact finite difference schemes can provide a simple way to reach the main objectives in the development of numerical algorithms, i.e., having a low cost on the one hand and a highly accurate computational method on the other hand. These methods have also been used for numerical simulation of some geophysical fluid dynamics problems. However, by splitting the derivative operator of a l compact centra method into one-sided forward and backward operators, a family of compact MacCormack-type schemes can be derived (Hixon and Turkel, 2000). While these classes of compact methods are as accurate as the original compact central methods used to derive the one-sided forward and backward operators, they need less computational work per grid point. The present work is devoted to the assessment of the accuracy of different methods. The one-dimensional advection equation with the known analytical solution is employed as a prototype model. Also, the truncation error of the traditional second-order MacCormack scheme, the standard fourth-order compact Mac-Cormack scheme, and a fourth-order compact MacCormack scheme with a four-stage Runge–Kutta time marching method are studied. Furthermore, to be able to examine the accuracy, the Lax–Wendroff, the leap-frog and the Beam–Warming methods combined with the second-order and fourth-order compact finite difference methods for spatial differencing are also used. In addition, the convergence rates of different methods are studied. It can be seen that the convergence rates are in agreement with the theoretical order of convergence. In this work, the traditional second-order MacCormack scheme (MC2), the standard fourth-order compact Mac-Cormack scheme (MC4) developed by Hixon and Turkel (2000) and a fourth-order compact MacCormack scheme with a four-stage Runge–Kutta time marching method (MCRK4) are used for numerical solution of the unsteady and non-linear Rossby adjustment problem (one- and two-dimensional cases). In the one-dimensional case, a single layer shallow water model is used to study the unsteady and nonlinear Rossby adjustment problem. The conservative form of the two-dimensional shallow water equations is used to study the unsteady and nonlinear Rossby adjustment problem in the two-dimensional case. For both cases, the time evolution of a fluid layer initially at rest with a discontinuity in height filed is considered for numerical simulations. جوان­نژاد، ر.، مشکواتی، ا. ح.، قادر، س.، و احمدی‌گیوی، ف.، 1395، حل عددی شکل پایستار معادلات تراکم‌پذیر دو بعدی و غیر هیدروستاتیک ­ایستایی جو با روش فشرده مک‌کورمک: مجله ژئوفیزیک ایران، 10(1)، 28–46. قادر، س.، بیدختی، ع. ع. و فلاحت، س.، 1389، حل عددی مسئله تنظیم راسبی غیرخطی ناپایای دو بعدی با استفاده از روش فشرده مک‌کورمک مرتبه چهارم: مجله فیزیک زمین و فضا، 36 (3)، 151-173. قادر، س.، بیدختی، ع. ع. و فلاحت، س.، 1390، حل عددی شکل پایستار معادلات تراکم­پذیر دو بعدی و غیر هیدروستاتیک جو با استفاده از روش مک‌کورمک مرتبه دوم: مجله فیزیک زمین و فضا، 37 (2)، 171-191. میرزایی شیری، ر.، قادر، س.، مزرعه فراهانی، م. و بیدخی، ع. ع.، 1396، حل عددی معادلات آب کم‌عمق با روش مک‌کورمک فشرده مرتبه چهارم: مجله فیزیک زمین و فضا، 43 (1)، 209-228. Ahmad, N. and Lindeman, J., 2007, Euler solution using flux-based wave decomposition: International Journal for Numerical Methods in Fluids, 54, 47-72. Boss, E., and Thompson, L., 1994, Energetics of nonlinear geostrophic adjustment: Journal of Physical Oceanography, 25,1521-1529. Cahn, A., 1945, An investigation of the free oscillations of a simple current system: Journal of Meteorology. 2, 113-119. Cebeci, T., Shao, J. P., Kafyeke, F., and Laurendeau, E., 2005, Computational Fluid Dynamics for Engineers: Springer. Esfahanian, V., Ghader, S., and Mohebolhojeh, A. R., 2005, On the use of super compact scheme for spatial differencing in numerical models of the atmosphere: Quarterly Journal of the Royal Meteorological Society, 131, 2109-2130. Fox, L., and Goodwin, E. T., 1949, Some new method for the numerical integration of ordinary differential equation: Mathematical Proceedings of the Cambridge Philosophical Society, 45, 373-388. Ghader, S., Mohebalhojeh, A. R., and Esfahanian, V., 2009, On the Spectral convergence of the supercompact finite-difference schemes for the f-plane shallow-water equations: Monthly Weather Review, 137 (7), 2393–2406. Ghader, S., and NordstrÖm, J., 2015, High-order compact finite difference schemes for the vorticity-divergence representation of the spherical shallow water equations: International Journal for Numerical Methods in Fluids, 78, 709-738. Ghader, S., Ghasemi, A., Banazadeh, M. R., and Mansoury, D., 2012, High-order compact scheme for Boussinesq equations: Implementation and numerical boundary condition issue: International Journal for Numerical Methods in Fluids, 69, 590–605. Gill, A. E., 1976, Adjustment under gravity in a rotating channel: Journal Fluid Mechanics, 77, 603–621. Gill, A. E., 1982, Atmosphere-Ocean Dynamics: Academic Press. Helfrich, K. R., Kuo, A. C. and Prat, L. J., 1999, Nonlinear Rossby adjustment in a channel: Journal Fluid Mechanics, 390, 187-222. Helfrich, K. R., 2006, Nonlinear adjustment of a localized layer of buoyant, uniform potential vorticity fluid against a vertical wall: Dynamics of Atmospheres and Oceans, 41, 149–171. Hirsch, S. R., 1975, Higher order accurate difference solution of fluid mechanics problems by a compact differencing technique: Journal of Computational Physics, 19, 99-109. Hixon, R., and Turkel, E., 2000, Compact implicit Mac Cormack–type scheme with high accuracy: Journal of Computational Physics, 158, 51-70. JavanNezhad, R., Meshkatee, A, H., Ghader, S., and Ahmadi-Givi, F., 2016, High-order compact MacCormack scheme for two-dimensional compressible and non-hydrostatic equations of the atmosphere: Dynamics of Atmospheres and Oceans, 75, 102–117. Kreiss, H. O., and Oliger, J., 1972: Comparision of accurate method for the integration of hyperbolic eqution, Tellus, 24, 199-215. Kuo, A. C. and polvani, L. M., 1997, Time-dependent fully nonlinear geostrophic adjustment: Journal of Physical Oceanography, 27, 1614-1634. Lax, P., Wendroff, B., 1960, Systems of conservation laws: Communications on Pure and Applied Mathematics, 13, 217–237. Lele, S. K., 1992, Compact finite difference shemes with spectral like resolution, Journal of Computational Physics, 103, 16-42. Mohebalhojeh, A. R., and Dritschel, D. G., 2007, Assessing the numerical accuracy of complex spherical shallow water flows: Monthly Weather Review, 135, 3876-3894. Navon, I. M., and Riphagen H. A., 1979, An implicit compact fourth-order algorithm for solving the shallow water equation in conservative-law form: Monthly Weather Review, 107, 1107-1127. Numerov, B. V., 1924, A method of extrapolation of perturbations, Roy. Astrom: Monthly notices of the Royal Astronomical Society , 84, 592-601. Roy, C. J., Smith, T. M., and Ober, C. C., 2002, Verifcation of a compressible CFD code using the method of manufactured solutions: AIAA Paper, 2002-3110. Roy, C. J., Nelson, C. C., Smith, T. M., and Ober C. C., 2004, Verification of Euler/Navier–Stokes codes using the method of manufactured solutions: International Journal for Numerical Methods in Fluids, 44, 599–620. Rivas, D., Fuentes, O. U., and Ochoa, J., 2005, Topographic effects on the dynamics of gravity currents in a rotating system: Dynamics of Atmospheres and Oceans, 39, 227-249. Salari, K., and Knupp, P., 2000, Code Verification by the Method of Manufactured Solutions, Sandia National Laboratories, Albuquerque, NM 87185-0825. Straka, J. M, Wilhelmson, R. B., Wicker, L. J., Anderson, J. R, and Droegemeier, K. K, 1993, Numerical Solutions of a Non-linear Density Curent: A Benchmark Solution and Comparisons: International Journal for Numerical Methods in Fluids, 17, 1-22. Williamson, D. L., Drake, J. B., Hack, J. J., Jakob-Chien, R., and Swarztrauber, P. N., 1992, A standard test set for numerical approximations to the shallow water equations in spherical geometry: Journal of Computational Physics, 102, 211-224. Wake, G. W., Ivey, G. N., Imberger, J., Mcdonald, 2004, The temporal evolution of a geostrophic flow in a rotating stratified basin: Dynamics of Atmospheres and Oceans, 39, 189-210.